Deep fry slices of coconut in its namesake oil and the result is rather intriguing. The flesh loses it's milky qualities, its fibrous texture and becomes tender, almost like a slice of fried mushroom. If I'd had my eyes closed for the first bite and someone had asked me to guess what I was eating, I am not sure I would ever have stumbled on the correct answer. Piled together with contrasting fresh coconut slices, peanuts, potato chips and a sweet chili sauce for dipping, these treats were part of the service, every time we ordered a cocktail at Navutu Stars in Fiji this past December. Since I started myself on an healthier eating endeavour today, it's probably just as well that Deep Fried Coconut is now little more than just another happy memory.
? Mars Bars aside - What's the strangest thing YOU'VE eaten deep fried ? The best Mojito in the world? Is Coconut Oil Healthy or Not? Boy was that a mistake. I could feel my arteries clogging with each bite! I really thought I was going to have a heart attack after eating it! Eency weency teeny tiny live shrimp (?) I dropped into a deep fryer, or should I say-- as they wriggled out of my fingers. very crunchy, a little salty. When my mom wanted to make me a treat, she would make me japanese shrimp chips. I loved to see the translucent chip becomming the crunchiest fluffiest pale pink in the pan. It looked like a weird flower opening just to my taste. Deep fried coconut sounds intriguing! I'll have to try some the next time I'm in Fiji drinking a mojito! The most interesting thing I've eaten deep fried is grasshopper, chapulines as they are called in Mexico. They tasted like dirt; thank G-d for tasty cilantro dipping sauces! The only deepfried things I've eaten are fish and chips! The coconut sounds deeee-VINE. I'm not sure what I've eaten deep fried that would be strange--herbs, maybe. Beccy what about the alligator we tried in Florida~ probably not considered unusual!! sam, that looks yummy! enidd's on a health kick too - want to run with her in the mornings? Y'all need to hit the county fair circuit! I've had both a deep fried pickle and a deep fried snickers bar on the same day! The snickers was better -- it gets gooey and sticky. The pickle was a giant salt bomb -- i could only manage 2 bites of it. I haven't tried it, but how about deep fried cell phone? Mmm, fried coconut... some of the street vendors in New York--the ones that also do chestnuts and almonds and stuff--also sell packets of fried coconut. I always make a point to get some when I'm there. 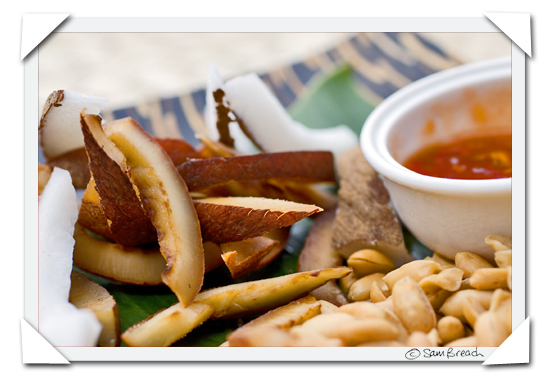 Had the coconut in Rota when I lived there served with coconut crab and finadeni sauce. Oh, and great sounding coconut! Deep fried eel head, teeth and all. Very crunchy. When I lived in Kyoto I used to go to this neighborhood hole-in-the wall sashimi place. At the end of every meal the owner chef would fish a live eel out of a tank, lay it on a cutting board in front of us, drive a thin stake through the eel's head, and chop up the body. The body parts would go into a delicious end-of-meal soup. The eel head would be deep fried along with all the bones of the fish we had eaten that night. We would then eat the crunchy deep fried bones along with our eel soup. Very tasty. The eel teeth were still pretty sharp though. Deep-fried whole tiny frogs. Or should I say frog. I couldn't bring myself to eat more than one, and that just to be polite, though it was mostly just crunchy.